Well, since trip 3 was a bust (See Getting Legal–Trip 3) I needed to go back when I had enough money. I scrimped and saved, but it wasn’t enough for the trip and the documentation. So, I asked for an advance on my paycheck and we scheduled the trip. It started out just like the others. We woke up early, although not as early as the last one, fed or moved to pasture the animals, and had our coffee. My husband had made bread the night before so that we could take a loaf with us since we didn’t have any extra cash to eat out. My son filled a water bottle and we were off. We said our prayers, this time including the successful completion of this legalization process along with a safe journey to San Miguel de Allende and back home. My husband had cleaned the battery cables in the hope that it would give us one last trip before dying and although we had to push start again, it seemed to be running better. We cruised through Celaya‘s transito (traffic) verification stop and were making good time. Eleven kilometers from San Miguel de Allende the truck began to shake. We were on a bridge and couldn’t pull over. The moment we could, we stopped and jumped out to check it out. Nothing under the hood seemed remiss, so my husband went under the truck. Immediately, he found the problem. La cruceta de la flecha que va pegada el eje (the joint in the back axle that holds everything together) had come loose and fallen off. Most of the pieces were still there, but one of the clips was gone, lost somewhere on the other side of the bridge. There wasn’t anything to be done but try and piece something together and get to a yonke (junk yard) or auto parts store and see if we had enough to buy the piece with the less than $130 to spare between us. So my husband went under the truck again to attempt this death-defying feat. Here’s the dangerous curve we managed to pull off at. Looks so innocent free of traffic doesn’t it? I mean literally, death-defying. We were clearly off the side of the road, however since it is common for large and heavy vehicles to straddle the solid white or yellow line (See Driving Hazards–slow moving vehicles) we were in mortal danger. I moved 100 meters or so down the road near the curve and made myself sentinel, waving cars on the line to the right. My son said I looked like I was shooing goats into the corral, but seriously, goats are easier than Mexican drivers to direct. I was sure that any minute we would be splattered to the winds, my husband, my son, me and the truck, by an 18 wheeler or tour bus barreling down the road. Talk about hair-raising! Only one driver stopped to offer what assistance he could, but my husband thanked him and declined, deciding not to leave my son and me with the truck on the side of the road. An hour and six near misses later, my husband crawled from out beneath Butch (the truck). He had flattened a nail to replace the missing joint and hoped it would hold. His hands visibly shaking, he started the car and we headed toward San Miguel, eyes peeled for a place to get the replacement piece. 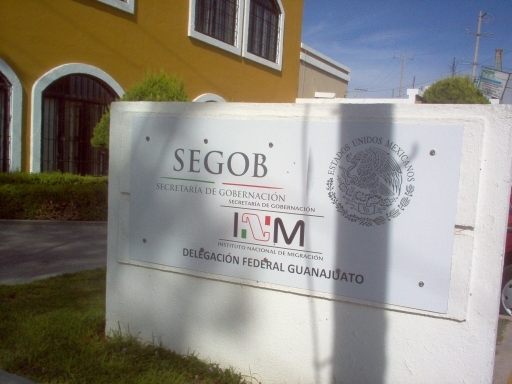 We stopped at Banamex to make the payment of $3815 pesos, then headed to SEGOB (the Mexican Immigration Office) with the receipt. I took a number and waited. My husband came in with me to help me keep my temper with the clerks, but he needed have worried. I was so exhausted from the adrenaline rush I had from directing traffic that I didn’t want any trouble. I had a nice conversation with a tall, elderly gentleman in line behind me. He was there for fingerprinting and had lived 13 years in México. He seemed to think my life in La Yacata was amazing. Go figure! Finally, it was my turn. I gave la muchacha (young lady) my receipt, but she needed 3 copies of it, plus the original, so I sent my husband scurrying across the street for those while I signed and signed. I turned the copies in, she stamped them and then, obviously remembering me (or perhaps my anguished outburst) from the last trip, asked where I lived. She said if I would wait a few minutes, she would find out what the probability was that I could leave my fingerprints today as well, thus saving me another trip. So I waited. About 10 minutes later, she came back to say that if I came back before 1 p.m. (when the office closed) I would be able to get fingerprinted. As it was only 11 a.m., we headed out to look for the truck part and see if we could get that done in the meantime. We had to tell our son, who had waited with the truck, that we would not make it back to Moroleón before school started that afternoon. (See Homeschool Variation) He had worn his uniform and done his homework on the trip, and was a bit worried what the maestro (teacher) might say, but my husband said he would take him to school for his assignments when we arrived home. So we set off in search of the piece. The first auto parts store had the piece, but it was too big for the make and model of our truck. The second two didn’t have the foggiest idea what my husband was asking for. The fourth place had the piece but wouldn’t sell just the clip, so $100 it was for the whole thing. My husband was pleased and ducked under the truck to do the repairs. Ten minutes later, it was fixed. With our remaining $30 pesos, we bought some oranges for lunch and some elotes (ears of corn) for later. We went back to SEGOB and broke our bread, peeled some oranges and drank some water, grateful for our abundance and fortune this day. At 12:30, I trotted back inside because entrance would be denied at 1 p.m. for anyone that isn’t written in the big appointment book at the front desk. Just shy of 1 p.m. the muchacha (young lady) called my name and had me leave my fingerprints on the application that would now be sent to México City for processing. She told me to check online in about 3 weeks to see when I could come and pick up my document. I thanked her sincerely and left. We cruised through the SMA verification checkpoint and then through the Celaya verification checkpoint without incident. We arrived home, exhausted but with a feeling of accomplishment that was lacking the last trip.